If you are short of time, the answers to the following 3 questions should let you know all you need to about the FlexCare Platinum Connected toothbrush. If we have missed something, let us know in the comments. If you want more detail, you can read our full Sonicare FlexCare Platinum review further down the page or watch our video review. No. Being a Sonicare brush the standards are high. There is a lot to like about this brush, particularly if you like the idea of ‘connected’ items. Good battery life, a great clean, different brushing modes and intensities and even a UV sanitizer!! The only sticking point is the price. The number of connected electric toothbrushes are growing and there are a few alternatives you could consider. A logical and better value alternative is the DiamondClean Smart from Sonicare. It does not cost much more, but offers a smarter brush with a premium travel case and other innovative features such are brush head replacement reminders. If you want something a bit easier on the wallet, but still a strong performer, the ProtectiveClean 6100 is the brush to go for, or you could check out our recommendation for best overall brush. 3. Where is the best place to buy the Sonicare FlexCare Platinum Connected? There are 2 different versions of this brush, the more premium HX9192/01 that comes with the UV Sanitizer is more popular and appealing overall. Both models are stocked by a variety of retailers. There is no ‘best’ place necessarily to buy this from, Amazon was the cheapest by about $30 at the time of writing (they are always pretty competitively priced). It is available from Kohls, Best Buy, Walmart and Fry’s to name a few. Picking up an honorary award at the 2017 Consumer Electronics Show, the FlexCare Platinum Connected has caught the eye of many in the technology circles and for good reason. It was the first Sonicare electric toothbrush to offer Bluetooth connectivity, finally bringing the brand more up to speed with Oral-B who had for a long time been making such an offering. It has since been joined by the DiamondClean Smart to strengthen the Sonicare portfolio and further expand the options. 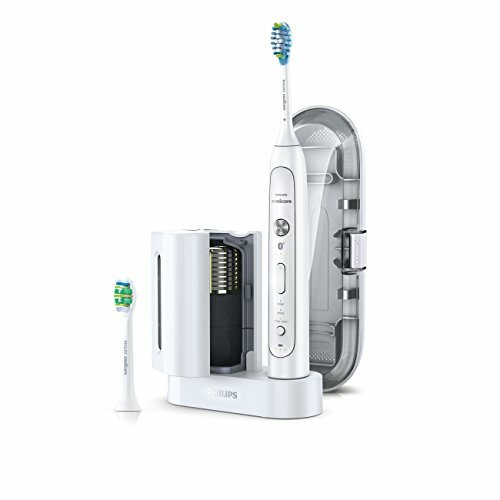 The only brush in the range to have the option of a UV sanitizer, the Platinum Connected takes oral hygiene to a new level. There are 3 different variants or models of this brush, the difference between the 3 is minor and is really related to what is included in the box. There is the HX9192/01 (view on Amazon) , which comes with a UV Sanitizer, and HX9192/02 (view on Amazon), which doesn’t. As a result the latter tends to retail for about $20 less. Aside from this, everything else included in the box and the way in which the brush performs is exactly the same. There is then too the HX9193/04 which comes with the UV Sanitizer but does too come with an additional brush head (1 x ProResults Gum Health) and 1 x 2 oz antibacterial breath rinse. And finally the HX9192/30 which is a dual handle package. It contains 2 x brush handles, 2 x AdaptiveClean brush heads, 2 x charging stands and 2 x travel cases. No UV sanitizer is included. In this review we are testing the HX9192/01 that comes with the UV sanitizer. Here are the key positives and negatives to this connected toothbrush. Bluetooth connectivity – The first Sonicare brush to offer such. Track and log in real time how you clean. 3 cleaning modes and intensities – Clearly labelled on the brush handle and easily accessed and controlled you have the choice of the mode and the power delivered to the teeth. Timed clean – A built in timer tracks how long you have been brushing for whilst also pacing you to ensure an even lean throughout the mouth. Simple but effective tools in improving your overall experience on an everyday basis. Battery life – Setting the standard at up to 19 days the performance from this brush is simply fantastic and puts some of the competition to shame. UV sanitizer – Addressing what is a big issue for some, a simple one press UV sanitization process keeps the brush head clean and free of germs and bacteria. Bluetooth connectivity – Advanced and innovative it is, but the must have the app with you nature to gain the real benefit is going to take time for users to learn and become accustomed too. Cost – It is expensive for many and justifying the extra spend is often not appreciated or understood until it is used. The even more expensive DiamondClean Smart is probably the better purchase. Environmentally friendly are unlikely the first words that come to mind when unpacking an electric toothbrush….but a small gesture of appreciation has to go to Sonicare for using cardboard inside their box to package the brush rather than plastic and polystyrene that is common with other brands. Once in hand it is clear that there is a certain weight and quality to the brush, it feels good. The front of the brush handle is quite busy, a number or icons, buttons and LED’s and it is certainly not the clean and minimalist look that the DiamondClean from Sonicare offers. Whilst I like some of the cleaner looking brushes, I am often frustrated by everyday practicalities which this brush actually solves. The all White body is broken up with only a long oval panel that runs down the front of the brush handle that is finished in a silver colour. On first glance the buttons look complicated but they are not really. At the top of the panel is the Philips Sonicare branding, with a large, clearly labelled silver power button below that. As power buttons go it looks a bit snazzy and catches the eye. A Bluetooth icon sits below this with then 3 LED’s just below. These LEDs relate to the power intensity of the brush, 3 settings, low medium and high. Each LED illuminates Green as the intensity changes. 1 Green LED and it is set to low, 3 and its on high. The White button below these marked with a + and – icon, like a volume key on a remote control, on the brush this controls the intensity. Towards the lower half of the brush are the 3 cleaning modes labelled each with an LED above the name. These LED’s illuminate as each mode is selected, all controlled by a simple White push button towards the bottom of the handle. Keep pressing to cycle through the modes. As you cycle through the modes, the relevant LED will shine Green to highlight which is selected. You need to select the cleaning mode prior to powering the brush on. You cannot change the mode, only the intensity when the brush is running. The last icon is a battery status, right at the bottom of the handle. Below this are 3 LED’s again. All light up Green when the battery is full, reducing to 1 as the power decreases. A single Yellow LED showing, signals that it’s time for a recharge. Solid and well built in hand, the cylindrical body is smooth on the sides, with the rear being covered in lots of small raised dots which the fingertips grip onto and help grip the brush, even when wet. Smooth lines lead to the detachable brush head. There are a number of different brush heads available from Sonicare, which you can purchase separately and attach to this handle. In the box 2 different heads are provided. There is 1 x AdaptiveClean and 1 x InterClean. Slightly different styles both are engineered to offer a deep clean to the teeth. Blue bristles on the brush head fade over time. These indicator bristles are designed to act as a visual reminder that you should replace the brush head every 3 months for maximum effectiveness. On the very bottom of the brush is a small circular recess, this is where the inductive charging pin of the charging stand fits when the brush is docked on one of the two charging stations provided. Fixed internally, the lithium-ion battery is not user removable. A fairly clinical design, you do not have the array of colour options open to you like there are with the DiamondClean or even the Sonicare 2 Series. The brush is far from unappealing, it is just a bit clinical and available only in the White colour. This is a water resistant brush and will survive trips in the shower, a dunk in water and general everyday use. However, Sonicare do advise not to bathe with it and avoid submersion and prolonged water exposure. A toothbrush is all about cleaning the teeth isn’t it?! So let me know speak about the cleaning modes. 3 modes are available on this brush. They are Clean, White and Deep Clean as you will see labelled on the brush handle. We explain all of Sonicare’s cleaning modes in detail here. These last for 2 minutes (120 seconds) with the exception of the White mode that offers an extra 40 seconds of cleaning time, designed for focusing on the front and most visible teeth. Irrespective of the mode you can also change the intensity or power of the cleaning that is offered. You use the + and – buttons to control this. Essentially you can make the power of the brush and the overall clean more enjoyable for yourself. At full power the brush will deliver up to 31,000 strokes per minute and if possible you should use the full power of the brush to get maximum benefit. Offering up to 10 times more plaque removal with the AdaptiveClean brush head when compared to a manual brush, if this is your first experience of an electric brush, it will be a good one. Given the price point, some might want extra cleaning modes that this brush does not have. But whilst the some other models do offer extra cleaning modes, we find that many users end up sticking with the normal clean mode after a few weeks anyhow. You do too in many respects have the ability to replicate other cleaning modes by changing the brushing intensity. Essentially that is what modes like Sensitive are, just less powerful configurations of the normal cleaning mode. I don’t dislike the clean offered by Sonicare brushes. My personal preference is for Oral-B, but the FlexCare Platinum Connected certainly leaves the mouth feeling very fresh and clean. What I do like is that when in use the brush is much quieter than Oral-B models. This goes for all Sonicare brushes. They produce an audible humming sort of sound where Oral-B models are much more mechanical and louder in use. If you brush you teeth when others are asleep in the home, the Philips is less likely to wake them. Built into most brushes and connected to the available cleaning modes is the timer and pacer. This breaks your normal 2 minute clean cycle into 6 x 20 second segments. A slight pause in the sonic power delivery causes a change in sound and alerts you to changing sections. These sections are your upper right, upper left, upper front, bottom right, bottom left and bottom front teeth. If you are using the accompanying app you will get a visual trigger too. In fact the smart sensors in the brush even monitor how well you clean each section. At the end of the cleaning cycle the brush will automatically power itself off which not only signifies the end of the clean but conserves power too. Many other brushes have this, but the timing facility, but rather than 20 second intervals it is 30 seconds, for 4 sections of the mouth. Ultimately both work out the same. Slightly odd that this model should do it in 20 second increments. Another nice feature is the pressure sensor that will alert you when you apply too much force when brushing your teeth. The bristles should essentially skim the surfaces of the teeth, when they don’t they do not clean as effectively and can actually do more damage. The brush will alert via a change in sound or an on screen message in the app. It would be nice if rather than just an audible warning you got a visual one like a light on the brush and not just in the app. Oral-B offer this. You do hear the change in the sound which is normally enough. Sadly not enabled by default, but explained in the manual is how to launch the Easy-Start feature. Great for first time users of an electric toothbrush, over a period of 14 clean the power delivered by the brush slowly increases allowing you to become accustomed. It eases you into the brush and I think is a really nice touch. Aside from the battery and motor built into the brush handle there are too a variety of smart sensors that work in harmony with the smartphone application for Android and iOS that can allow you to track and monitor your tooth cleaning habits. Using Bluetooth connectivity you can pair the Sonicare FlexCare Platinum Connected to your mobile device and see in real time how well you are brushing. You then log this in the application. Some will find this to be a bit gimmicky too and think it is more effort than it is worth and in some respects it is. But, there is real value to be had if you are trying to improve your oral health, need assistance and encouragement and could do with sharing your performance with your dental professional. If you don’t think you will use this feature then I see little reason to opt for this brush. If you are keen to give it a go and get stuck in then great, the overall is experience is pretty good. There are actually a lot of parts to the app itself. I could write for a long time about it and all the features it offers. Take a good look at some of the screenshots included as from this you can gain a lot more information, in less time than if I wrote about them all. Available for Android and iOS devices you can download the app from the Play Store and iTunes. The app is well thought out and works reasonably well and I did not experience any crashing or stalling in the app. I can’t help but compare the Sonicare app to that of Oral-B’s for their connected toothbrush, there is a lot of similarity, but I have had the Oral-B app crash whereas I did not with the Philips. With either app, to actually begin logging the clean and see your progress on screen you need to launch the app before you begin your clean. Turning the brush on and having your phone close by is not enough. This connected brush uses sensors in the brush handle to determine the location of the brush within your mouth and works on the basis of you following a particular pattern as you clean, starting in the top and working around and then to the bottom. Whilst you need the phone and app near by you do not need to be actually looking at your phone the whole time. Now this brings me onto something Sonicare have overlooked. Whilst some will take their smartphone in the bathroom others are cautious for hygiene or for the fact there is water and many phones are not resistant to such. It’s not like the phone will get wet, but it stands a higher chance. There is no smartphone stand included which I think would have been a great idea. If you are to be encouraged to use the app a stand would have given a place to mount the phone whilst brushing rather than having to hold it in the hand or place it on a countertop. I would have felt more assured of putting it in a stand. The stand may have protected the phone somewhat and also allowed you to easily see the timer and your performance. When actually brushing the teeth and working with the app, Philips work on the basis that you follow the ‘correct’ convention for cleaning your teeth. Oral-B on the other hand have taken the more innovative approach which I think in principle works better from a consumer’s point of view, but sadly from reliability, accuracy and regularity does not. They make use for the front facing camera on the phone to be aligned with your face and use a series of sensors and the camera to determine location. Thus if you begin cleaning your bottom teeth first it knows this, whereas the Philips does not. This therefore means that the Oral-B is more accurate in logging which parts of the mouth you actually cleaned and for how long, but the innovative and more complicated nature of this means it is not always accurate; and the process of remaining aligned with the camera during your clean is a bit more cumbersome, especially when you consider mounting the smartphone holder etc. See our Genius Pro 8000 review to find out more about this. What this means is that whilst Oral-B’s solution is more innovative and in theory better in practice Philips has the edge. You also get an alert if you are moving the brush too much which is good to see. The app logs how long you have been using a brush head for, reminding you when to change as well as asking questions such as did you floss, rinse with mouthwash etc. These prompts can be turned on or off, but if kept on it will log your responses and keep track of these details too. The brush does restore cleaning data for a few days if you do not pair it with a phone, it is easy to forget sometime unless you are in the habit. When you next connect the data is synchronised to the app filling in the days you have missed, assuming you have cleaned your teeth. It will omit flossing and mouth washing data though. There are additional elements to the app aside from the logs of your cleans, flossing and rinsing. The battery status is shown but it is still a bar and not a percentage (%). Goals allow you to achieve certain targets such as gum health and whitening, you have some pre-set but can create your own. So overall a very nifty and innovate app that you need to invest a bit of time and practice into, to get full value from it. When you have finished cleaning your teeth you should rinse your brush head off to wash away residue paste and bacteria. For the most part it is fine, for years you, I and others have been doing it like this, but with the HX9192/01 there is an additional feature included. One of the 2 charging stands included has a UV sanitizer built in which when run kills off bacteria on the brush head — we’ve written more about these in our post on the best UV sanitizers. The fairly compact sanitizer can accommodate up to 2 Philips brush heads. 2 little prongs allow the heads to be placed inside and stood upright. Position so that the bristles face the internal lamp, close the door and press the green button on the top to begin the cleaning cycle. Lasting 10 minutes the UV bulb produces rays that further kills any lingering bacteria trapped on the brush head. I really like this idea. It seems logical and could help long term to reduce the chance of oral health issues. That said many of us have gone for years without using or needing this and other brushes don’t offer such. Whilst fairly compact it does take up space on the countertop, more than a normal charging stand. However, it does too provide a home for the brush heads when not in use. In the box is a travel case for the brush handle and up to 2 brush heads. A fairly simple travel case it is of plastic construction with an off white rear half to the case and a smoked clear section on the front to be able to see what is inside. Certainly functional it protects the brush handle and heads from accidental damage or activation when in transit. The case does not offer charging for the brush in the case like the DiamondClean series. As a moulded brush with a virtually all in one design, maintenance is simple on this brush, just a rinse and a wipe. However it should not really be required. Should something go wrong, there is as standard a 24 month warranty is provided. Something that we often recommend here at Electric Teeth for you to get more value from your brush, is to share the handle with another user in the family, just changing the brush heads each time. Whilst possible, sadly the Bluetooth connectivity option becomes redundant. This brush can pair with multiple phones but is only capable of logging one person’s clean data. No matter if you sync to a new phone the data logged is the same. Sonicare have always excelled when it comes to battery life that each of their brushes offer. Many of their models offer double that of Oral-B equivalents. There is a premium price to be paid often, but if this is important to you then it can be worth it. Our own research has suggested that many see battery life as relatively unimportant when it comes to choosing a brush, so the FlexCare Platinum here is perhaps boasting a battery life better than many actually want. However, I personally hold a brush that has at least 2 weeks usage possible form it with a little higher regard. I like the idea of travelling without needing to take a charging solution fro the brush. Unlike the DiamondClean, the Platinum can’t be charged in the case. The FlexCare Platinum Connected ticks that box for me offering up to 19 days battery life. This is in part affected by what modes you use and for how long, but on the typical ‘Clean’ mode that lasts for 2 minutes and should be completed twice a day a brushing time of 76 minutes is perfectly achievable. The White mode available on the brush lasts a little longer, so whilst you will get the same usage time from the brush, the actual number of cleaning sessions may be less. A large battery like this requires a bit of time to recharge it when love. In fact to fully charge it can take up to 24 hours to charge. Provided in the box are 2 charging stands, a standard charging stand like that found with most other electric toothbrushes and then a larger stand that also includes the UV sanitizer. You can use one or both charging stand depending on what suits you. On either is a small prong that marries up with a recess on the bottom of the brush handle. The brush charges via inductive charging. When placed on the charger an audible sound can be heard. Supporting voltages from 100 to 240V, just connect the plug into the socket and our away. The good news here is too that the wider voltage support means you only need a plug adapter and not a voltage adapter if you travel. On the front of the brush handle are 3 LED’s that relate to the battery life. When powered on the LEDs will power on to show the power. 3 Green LED’s will mean it is fully charged, whilst a single Yellow LED will mean power is low. If you hear two sets of five beeps and the Yellow LED of the battery level indicator flashes, the brush will turn off until placed on the charger, where it will start to recharge. When on the charger, the LED’s will turn Green, lighting up one by one until the brush is fully charged. Whilst it takes up to 24 hours to fully charge the brush, it is safe to leave it on the charging stand. However good practice is to occasionally run the battery down and run the battery through cycles to prolong the battery usable life. Something that I have called for on all Bluetooth enabled brushes, but to date only found on the Kolibree Ara, is the ability to view the battery status as a percentage (%) on the phone. This is a bit more accurate than a number of LED’s or high, medium or low. I would have thought that the application on the smartphone could display such. As outlined earlier in the review there are 2 versions of the FlexCare Platinum Connected electric toothbrush. The difference between the two is that the more premium HX9192/01 comes supplied with a UV sanitizer and charging stand. Typically the premium commanded for this is $20, which I think is a very fair price given what it offers. It is however the only brush from the premium tier brands to offer such and it is not a must have. For the germ and bacteria conscious there are certainly some gains to be had, but you could potentially save by ditching the sanitizer and going for the HX9192/02 that comes packaged without it. With all that said, shop around carefully, because at the time of writing, although more expensive, one retailer was offering a $30 discount, that actually made the more premium model with the sanitizer cheaper than the one without. Sonicares recommended retail price for these brushes varies by $20, the suggested sale price is $200 and $220. Unfortunately for you or I most of the larger retailers stick fairly close to these prices too. Whilst there will always be some variance, the average price was $180 and $200, so just $20 off RRP. These prices are pretty much in line with other Sonicare models. Only the DiamondClean and DiamondClean Smart sit above this brush in the range. The DiamondClean is theoretically the more premium brush with more cleaning modes and a better travel case, it does lack Bluetooth, but is sold at roughly the same price. The DiamondClean Smart is the ultimate brush and combines pretty much the appeal of the FlexCare and the DiamondClean into one, but commands a small premium. In fact all things considered, the DiamondClean Smart is probably the better buy. For about a further $20-40 (as a rough average) you do gain quite a bit more in terms of finish and box contents. It is certainly worth considering. Oral-B is also worth consideration. Sonicare have always commanded a premium price, particularly as the battery life is better, but the Genius Pro 8000, Oral-B’s flagship brush is around $50 less. That is a fair saving. This saving also becomes a little greater if you factor in the cost of replacement brush heads. Average retail prices bring a single brush head out at $5 for Oral-B and $8 for Sonicare. Brush heads require replacement every 3 months, so there is over $30 to be saved on brush heads alone. Priced over 3 years the average ownership cost for the FlexCare Platinum Connected toothbrush with UV sanitizer is $288 or $0.26 per day. Price should not be the only consideration when choosing to go for this brush or not. My perception or price and value will differ to your. However, from my experience, whilst the FlexCare Connected offers a lot, for not much more you gain quite a bit extra from the DiamondClean Smart 9500 Series. If the budget is tight, an Oral-B model like the Genius Pro will offer a noticeable saving for what are really few shortcomings. Whilst many brushes do go on for years longer, the reality is that the expected working life of an electric toothbrush is some 3-5 years. Unlike a lot of products that come with shorter warranty periods, the FlexCare Platinum Connected is backed by a 2 year warranty form Philips should anything go wrong. I really hope it does not, because it is an inconvenience, but this is an electrical product and whilst it is very clear that Sonicares quality and attention to detail is high, there is always a small chance that products can fail. Unlike the very cheap and cost effective electric toothbrushes that seem to be becoming ever more popular you can clearly see from handling and examining the brush that the fit and finish is good. All brushes reviewed here at electric teeth are done so thoroughly. Whilst this brush is not tested by special lab equipment it gets our discerning once over and I can I report no concerns were present. To prolong the life of any brush, give it a rinse and a wipe down to remove grime that builds up and then towel dry. Subject to what price you can actually find this model for, it is likely that Sonicare DiamondClean Smart is the ‘better value’ purchase. However, do not let price be the overriding factor in the decision making process. The FlexCare Platinum Connected deserves much praise for delivering a connected brushing experience in the way that it does. It might not be the best looking brush, but simple practicalities make this brush a real winner in everyday use. From the automatic power off to the ability to change the cleaning modes and brushing intensity via separate buttons. The UV sanitizer is far from a necessity, but adds a degree of extra value and user confidence to such a product, but forgoing this is one way to save a few dollars if you really don’t think that you will make use of it. What is evident is the quality, it feels solid, the battery life is stellar and there is most certainly the feeling of detail and perfection and not some rushed job just to make a quick buck. At the end of the day, it is your teeth that need to be clean and healthy, I have no reservations in suggesting this brush can do a great job. As per the manual, consumers should start brushing at the upper, right quadrant of their mouth. If not started in this position the App will effectively align with the brushing activity. Featuring innovative Smart Sensor technology: Location sensor shows where you're brushing too little for better coverage. Pressure sensor lets you know if you are brushing too hard. The Touchup feature provides customized guidance based on your personal brushing data so you can immediately address any missed areas and achieve a more complete clean. Is the FlexCare Platinum Connected toothbrush an oscillating brush? This is the comprehensive everyday cleaning mode that works with the provided brush head to effectively clean the teeth and remove up to 10% more plaque than a manual brush. This lasts for 2 minutes. A 2 minute and 40 seconds cleaning cycle A 2 minute cycle that alternates between white and massage with an additional 40 seconds for polishing your front teeth. What is deep clean mode? An invigorating deep massage designed to deliver an exceptionally clean experience. No, it has the 3 cleaning modes, clean, white and deep clean. Provided with the FlexCare Platinum Connected is a single AdaptiveClean and InterCare brush head. These are 2 from a range of interchangable brush heads that can be used with the brush. Does the Pro 5000 have a pressure sensor? Does the Platinum Connected have Bluetooth? Does the FlexCare Platinum Connected come with a warranty & how long is it? Yes, it comes with a 2 year warranty which covers mechanical faults and not user damage. Does the Platinum Connected have a built in timer? Yes. There are two main timers built in. There is the timer for the length of the clean, which is typically 2 minutes, at the end of the 2 minutes the brush automatically powers off. You then have the pacer which activates at 20 second intervals, typically. Rather than 4 quadrants, Philips segment the mouth into 6 giving 20 second intervals rather than the more common 30 seconds for 4 quadrants. The battery lasts up to 19 days which is equivalent to 38 cleans or 76 minutes, which is incredible. Yes, a charging station is included with the FlexCare Platinum Connected. In fact there are 2 (subject to variant). A charging stand only and a charging stand with UV sanitizer. You can use both or one or another. Battery status icons, what do they mean? When not on the charger, a single yellow LED indicates a low charge, whilst 3 green LED’s indicate a full charge. When on the charger the LEDs will turn green as the brush charges. If you hear 2 sets of 5 beeps and a yellow LED. You need to charge the brush. What is the Easy-Start mode? There is an option to enable the easy-start mode that will over the course of 14 days, gradually increase the power of the brush, providing each clean is a minimum of 1 minute. The brush has 3 power intensity settings. The lowest setting will light up 1 green LED, the medium 2 and high 3. How long does the UV sanitizing clean take? The UV sanitizer runs for 10 minutes to clean the brush head. No, the charger has not been designed in this way. Can I use the Platinum connected in the shower? No. Whilst the brush handle is water resistant, Sonicare advise against this. Do you own or have you used the Philips FlexCare Platinum Connected?